This morning as we were just starting our morning routine of boat chores we heard a friendly voice calling into our boat “hello, neighbors”. The boat anchored next to us was planning on going hiking and wanted to check and make sure that they hadn’t put their anchor down on top of ours. We weren’t really sure, so we pretended like we knew and told them they weren’t in the way. As it turns out they really weren’t and we were able haul anchor easily and head on our way to Brimstone Island. 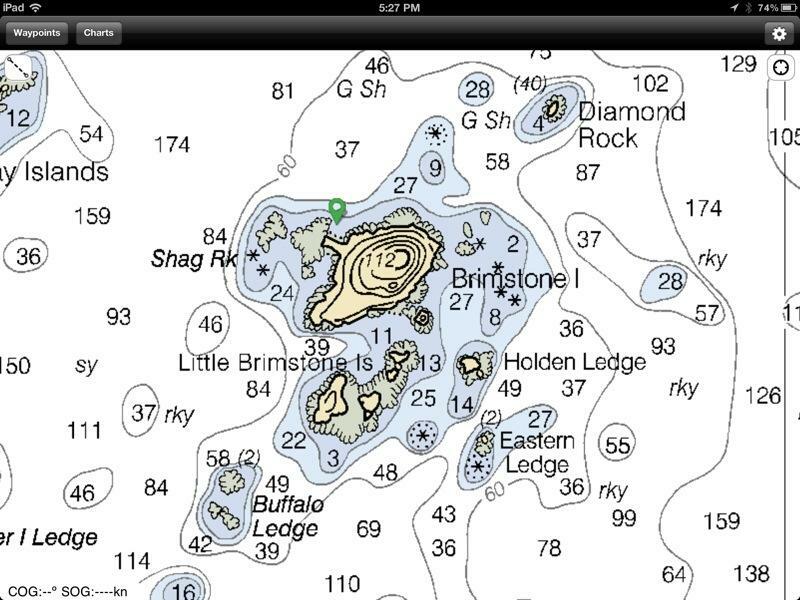 We read about Brimstone Island in Cruising World magazine back in 2010. It was described as a rare north atlantic basin volcano, long extinct. 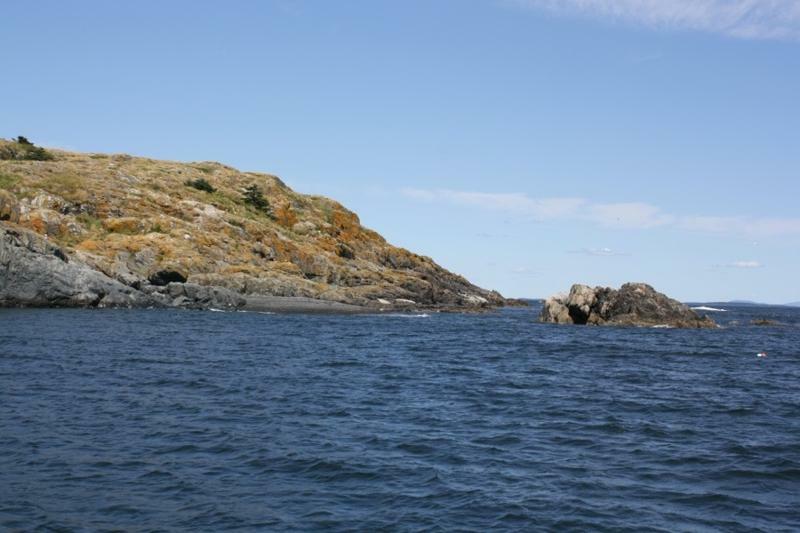 It described an exotic location with a black rock beach out on the edge of the Isle au Haut bay. We were very excited as we motored out of Duck harbor and proceeded to raise sail. It took us about an hour and half until we were making our approach to Brimstone. Since the wind was out of the North we couldn’t anchor in the recommended location. We sailed all the way around the island into a little “cove” on the south side of the island. We tried to anchor where the “11” is between Brimstone and Little Brimstone on this chart. The anchoring did not go well. The anchor went down but wouldn’t grab into the bottom so while we were trying to set the anchor we kept backing closer and closer to rocks. Stephanie finally asked the burning question “Is this even worth it?” We had sailed 3/4 of the way around the island and it looked like every other remote Maine island we had passed. We think that this is the “beach” that was described as being made of black rocks. Leaving Brimstone started the next phase of our journey, we had to find a place to anchor for the night that was sheltered from the Northwest winds that started up today, and boy were they blowing. 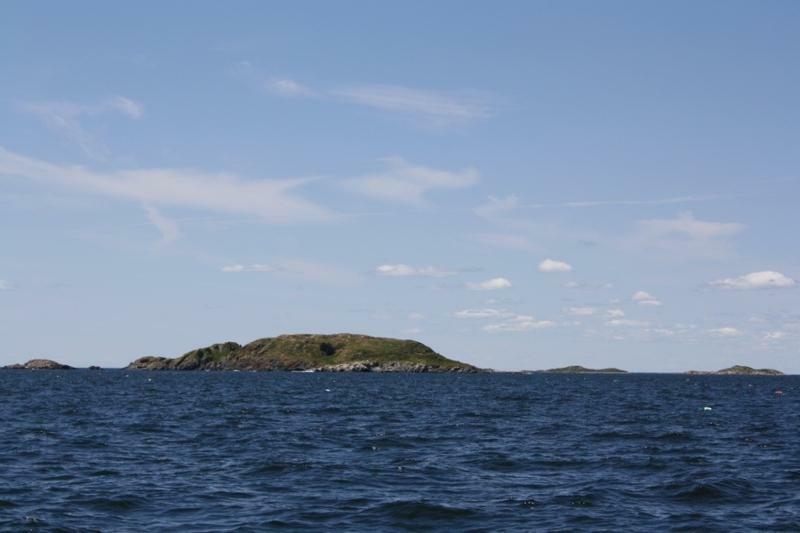 We found a couple of likely spots on the Fox Island Thoroughfare and headed north through East Penobscot bay. We were sailing fast, but going slow. The tide was on its way out and was flowing around 2 knots exactly opposite the direction of where we wanted to be heading. Eventually we did make it to the Fox Island Thoroughfare and tucked into Kent Cove for the night, a spot that offered shelter from the NW wind, and mud for the anchor to stick in. 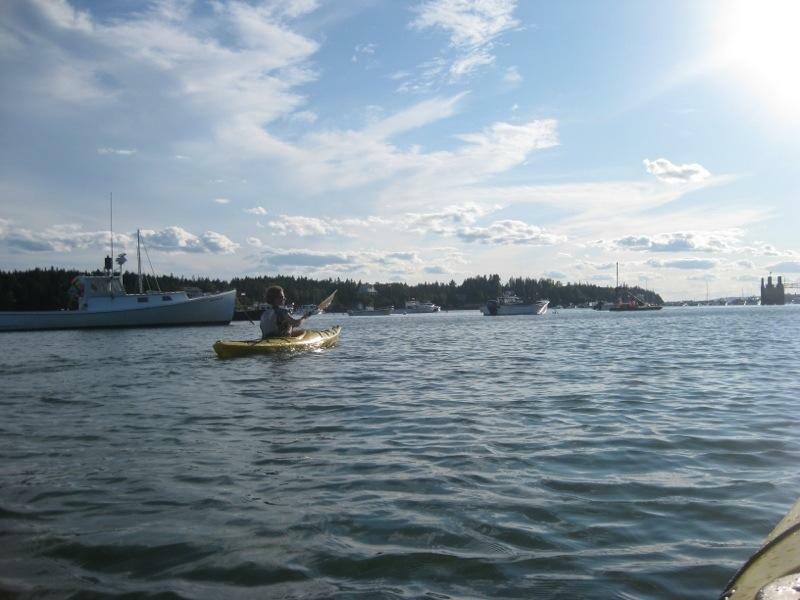 We took a kayak trip in to North Haven to check out the town and enjoyed some great fried shrimp at the local dockside restaurant! 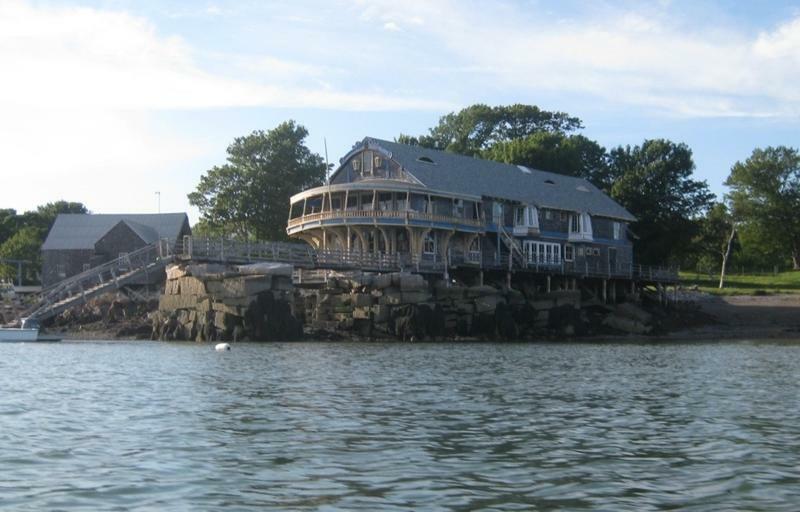 We passed by this unique bit of island architecture on our way in to North Haven. We think we may have found the pirate’s lair. Engine update – Our old reliable diesel engine is giving us a little bit of trouble. The oil level keeps rising. Uh-oh. After draining the oil the other day I found no water in the oil, which makes it look like we are leaking diesel oil into the oil. After doing a little bit of internet research it appears that the most likely and cheapest (fingers crossed) problem is that our fuel lift pump has a bad diaphragm. On a normal diesel engine this would just cause a diesel leak, but since our engine is installed in a boat the leak is diverted into the oil pan, diluting our oil. We are planning on ordering a new fuel lift pump and attempting the replacement ourselves, rumor has it that this is a “simple” engine project.